An artistic French mouse struggles with his painting style until he receives some helpful advice from Santa on Christmas Eve. Henri the mouse lives in a cozy house in the French countryside, wearing a black beret and an artist’s smock as he works in his studio. He is trying to create a special painting as a Christmas gift for a friend, but multiple paintings are started and rejected as not good enough before Henri has a surprise meeting with a traditionally dressed, white Santa who has stopped in to deliver gifts. Santa’s advice inspires Henri to “paint from my heart,” and the mouse successfully completes a portrait of his best friend, a white cat. 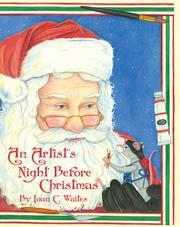 The text uses the opening words and the meter of “The Night Before Christmas,” with a few hints at the original poem such as Santa’s wink and nod before departure. Terms for artistic techniques are woven into the story along with several French words and phrases; these are defined in appended glossaries along with an author’s note describing the miniature reproductions of famous paintings on Henri’s walls. Serviceable watercolor illustrations in jewel tones use a double-page-spread format with each border showing a different type of paint, ink, or illustration technique.